Attention readers fed up with your jobs: call in sick tomorrow and dive into this debut crackling with the energy of handfuls of underpaid, underappreciated, tired-as-heck assistants hungry for what’s owed them. Tina Fontana is a 30-year-old NYU graduate and executive assistant to billionaire Robert Barlow, CEO of major media company Titan Corporation. She knows the most intimate details of Robert’s life, saving the day for him constantly, and yet she’s stuck living paycheck to paycheck. What’s happened to her? 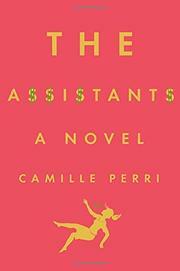 How does she work so hard and never rise above being an assistant while the men around her make fortunes? The answer to Tina’s problems shows up in the form of an expense report. When she’s mistakenly reimbursed for a significantly large sum, she struggles with whether to report the error. For her, this could mean starting over debt free: “I could have savings….All at once I would become less anxious and more generous.” For Titan Corporation, the sum is measly. One major theme of Perri’s debut is this: “There is so much money.” Mostly in the hands of those who don’t deserve it. When Tina decides to keep the money and pay off her student loans, she doesn’t get off scot-free. Emily Johnson, the not-so-nice accounting assistant behind all the signatures, catches her. Now she has to figure out how to pay off Emily’s loans too (oh, and become her best friend), or Tina is as good as ruined. It doesn’t take long for rumors to spread and for Tina to become a hero, the Voice of the Assistant: “I could see how beneath all the lacquer these girls were hungry,” she realizes as her mission becomes greater than herself. Perri’s writing is quippy and the pace breezy; despite all the hurdles Tina has to leap over, things go pretty smoothly. Oh, and the hot, sensitive guy in the office? On her quest to take over Titan, Tina gets him too. Don’t think too hard about this one—just enjoy the sweetness of plotting revenge over cocktails (expensed, of course). You’ll feel better after reading, promise.